Stories of young children separated from their families at the border was heart wrenching as we wondered how such cruel actions could be part of U.S. policy. With public pressure, some politicians intervened and there was some easing of the policy. However, months later, many families are still not reunited and the fears of detention and deportation remain, including here in Chicago. These issues didn’t just begin but have a long history. It isn’t hard to imagine that there would be psychosocial impacts – short and long term – as a result of the anxieties and traumas created by these actions. 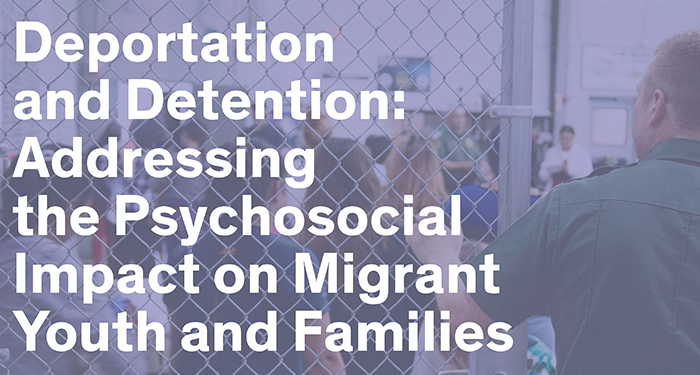 Please join us on Friday, September 28, 2018 from 9:00 a.m. – 12:00 p.m. at UIC Student Center East 750 S. Halsted to hear practitioners, advocates and researchers speak about context, impacts and strategies related to the psychosocial impacts of deportation and detention on migrant youth and families. The event is hosted by the UIC Center for Global Health, the Institute for the Humanities Global Migration Working Group, and the Great Cities Institute. The Healthy Communities Foundation and the Chicago Community Trust are supporting the event. Though we already have over 250 RSVPs, there is still room for your RSVP. We hope that you can join us. Luis H. Zayas, Ph.D., is Dean of the Steve Hicks School of Social Work and the Robert Lee Sutherland Chair in Mental Health and Social Policy at The University of Texas at Austin. He is also Professor of Psychiatry at the Dell Medical School at UT. Zayas holds an MSW and a Ph.D. in developmental psychology from Columbia University. As a researcher and practitioner, Zayas has examined the effects of deportation on the mental health of U.S.-born citizen-children of undocumented immigrants. He has conducted numerous evaluations of citizen-children and testified in immigration court on behalf of citizen-children and their families. His book on this topic is titled Forgotten Citizens: Deportation, Children, and the Making of American Exiles and Orphans (Oxford University Press, 2016). Recently, Zayas has looked at the effects of family immigration detention on refugee children and mothers from Central America. As an advocate, Zayas has joined several federal class-action lawsuits on behalf of refugee and immigrant children held in immigration detention and of DACA youth. Cindy Agustin has extensive experience working with immigrant communities in Illinois as an organizer, advocate, and service provide. She has worked at the Illinois Coalition for Immigrant and Refugee Rights (ICIRR) as a youth organizer to build immigrant youth-led networks across Illinois. She has also worked at Heartland Alliance’s National Immigrant Justice Center (NIJC) where she conducted outreach across immigrant communities in Illinois, provided direct legal services as a paralegal and eventually a Board of Immigration Appeals (BIA) accredited representative, and oversaw the Deferred Action for Childhood Arrivals (DACA) pro bono clinic project. In 2016, she returned to ICIRR to support efforts integrating mental health and emotional well-being into ICIRR’s current work. Through ICIRR, she has worked with the Coalition for Immigrant Mental Health (CIMH), a network of mental health providers, researchers, community organizations, and community members who are working to make mental health services accessible to the undocumented community. She earned her B.A. in Comparative Human Development and Master’s in Social Service Administration from the University of Chicago. Her interests include exploring the intersections between immigration policy, community organizing, and immigrant mental health. Dagmara Avelar is the Program Manager for the New Americans Initiative and Immigrant Family Resource Program at ICIRR. As the manager of these programs, she works directly with 59 community-based organizations across the state of Illinois to address barriers to citizenship as well as language access primarily for immigrants and refugees. Dagmara was born in Quito, Ecuador but moved to Illinois at the age of 12. As a new immigrant settled in the southwest suburbs, she experienced first hand the challenges of moving to a new country. For the past 10 years, she has dedicated her life to advancing pro-immigrant policies and programs. She was an active member of a delegation advocating for the passage of the DREAM Act in 2007, worked in several get out the vote efforts to promote civic engagement of new Americans in the southwest suburbs and most recently has worked closely in the creation, implementation, and coordination of ICIRR’s Family Support Hotline. This hotline was the first of its kind in the state of Illinois catered to people who were experiencing a deportation crisis. Prior to her current role at ICIRR, Dagmara worked at Instituto Del Progreso Latino as an accredited representative with a focus on citizenship and DACA and was able to assist over 400 people in their immigration journey. She earned a BA. in Justice Studies with a minor in Political Science from Northeastern Illinois University and is currently working on her Master’s in Urban Planning and Policy at the University of Illinois in Chicago. Jessica Boland, LCSW is the Director of Behavioral Health Services at Esperanza Health Centers, a Federally Qualified Health Center, in Chicago, Illinois. As Director, Ms. Boland oversees behavioral health programming and staff, and coordinates efforts relevant to the Hispanic/Latino community as they pertain to mental and emotional health. Esperanza serves a majority Latinx immigrant population, and Ms. Boland has worked closely with healthcare providers and community organizations to provide advocacy and support to families affected by current immigration policy. Prior to Esperanza, Ms. Boland worked at several nonprofit organizations in the Chicagoland area, including the areas of community mental health, perinatal mental health, domestic violence and sexual assault, and child welfare before focusing on community-based integrated healthcare. Ms. Boland completed her Master of Social Work (MSW) degree from Loyola University Chicago, and graduated from the University of Michigan-Ann Arbor in 2008 with a Bachelor of Arts degree in Sociology, and academic minors in Spanish and Gender Studies. José Bravo is the Executive Director for the Just Transition Alliance (JTA), where he works directly with Environmental Justice (EJ) Communities and Labor (organized and unorganized) to develop best practices and build meaningful and impactful alliances. José is also the National Campaign Coordinator of the Campaign for Healthier Solutions (CHS), a community driven campaign towards healthier discount stores. Bravo’s work in social justice issues is rooted from his upbringing in the Southern California fields alongside both his parents. Bravo has also been doing work on immigrant rights issues since his days as a student organizer in the 80’s to the present. His participation in the Environmental Justice (EJ) movement since 1990, has over the years gained him recognition as a national and international leader in the EJ movement and co-founder and leader of the Just Transition Movement. Tanya Cabrera graduated from Northern Illinois University with a major in History with minors in Political Science and Sociology. Recently, completed Northeastern Illinois Universities ENLACE graduate program in Leadership in Higher Education. She completed one year at IIT Kent before welcoming twin girls in 2014. She has served as Chair of the National Advisory for Undocumented Student Access – College Board. A committee formed to call upon 2/4 year institutions to create policy and procedure for Undocumented Students across the United States. Tanya previously worked under the Vice Provost at IIT, as the Associate Director for Minority Outreach and Undocumented Student before joining UIC in the summer of 2016. At the institution she supports all students as, Assistant Vice Provost for Student Inclusion – in particular UIC’s undocumented students. In 2011 Tanya was appointed by former Governor Quinn and current Governor Rauner (2016) to serve as Chairman for the Illinois DREAM Fund Commission. A role she feels will set the platform for educational access and degree obtainment for undocumented students in Illinois and across the U.S. Tanya claims, that her early exposure to community activism and family values established her commitment of civic responsibility to her family and community. Oscar A. Chacón is a co‐founder and executive director of Alianza Americas, a Chicago-based national network of Latin American immigrant‐led and immigrant serving organizations in the US. Oscar is an immigrant from El Salvador. He has been an organizer and a leader on community justice issues at the local, national and international levels for over 30 years. He has occupied leadership positions in multiple organizations including Oxfam America, Centro Presente, the Northern California Coalition for Immigrant and Refugee Rights, and Heartland Alliance for Human Needs and Human Rights. Oscar is a member of the Inter-American Dialogue, the American Bar Association’s Immigration Commission and the Latino-Jewish Leadership Council, among other professional associations. Oscar is a frequent spokesperson, domestically and internationally, on economic, social, political and cultural issues affecting Latin American immigrant communities, including the nexus between human mobility, economic inequality, white supremacy and racial justice. Alianza Americas mission is to improve the quality of life of Latin American immigrant communities in the US, as well as of peoples throughout the Americas. Miguel C. Keberlein joined the Legal Aid Society from the Legal Assistance Foundation (LAF), where he served as the Director of the Immigrants and Workers’ Rights (IWR) Practice Group, a position he held since 2012. In that role he led the Group’s statewide strategy and initiatives, directed LAF’s Migrant Project, litigated federal and state cases, as well as supervised a team of attorneys. Keberlein also secured more than $750,000 in grants supporting immigrants and workers’ rights, and launched LAF’s annual “Farmworker Blues” fundraiser. Keberlein earned his Juris Doctor degree in 2002 from the University of Wisconsin-Madison Law School. He also holds a Master’s degree in Third World Development Support from the University of Iowa, and a Bachelor’s degree in International Relations from St. Norbert College. Patrisia Macías-Rojas is an Assistant Professor in Sociology and Latin American and Latin Studies at the University of Illinois at Chicago. Her research interests are in the areas of race, law, and migration. Her current work examines historical, economic, and political links between the immigration and criminal justice systems. Combining history and ethnography her recent book, From Deportation to Prison: The Politics of Immigration Enforcement in Post-Civil Rights America (New York University Press, 2016) analyzes how the politics and policies of civil rights reforms and mass incarceration gave rise to the punitive turn in immigration and border enforcement. From Deportation to Prison won the 2017 Oliver Cromwell Cox book award from the American Sociological Association’s Section on Racial and Ethnic Minorities. Virginia Martinez is an attorney who has spent most of her career working in non-profit organizations and has been a strong advocate for Latinos, women and children. She is a nonprofit management consultant and collaborative leadership trainer. She served as Sr. Policy Analyst for the Illinois Latino Family Commission until early 2015. The commission was established by statute to improve the opportunities and resources available to Latino families throughout the state. Previously she was Legislative Staff Attorney in the Chicago Office of the Mexican American Legal Defense and Educational Fund (MALDEF) where she was responsible for monitoring regional, state and local legislation and policy issues affecting Latinos in the 11-state Midwest region. She was also formerly Director of the International Center for Health Leadership Development at the University of Illinois at Chicago, developing collaborative leadership capacity of individuals from communities, community health centers, and academic institutions and was dedicated to building multidisciplinary bridges to join communities and institutions. Mary Meg McCarthy is the executive director of Heartland Alliance’s National Immigrant Justice Center (NIJC), one of the nation’s foremost immigrant and human rights advocacy organizations. Under Mary Meg’s leadership, NIJC has become a leading organization dedicated to advancing justice for immigrants. Working with a pro bono network of 1,500 attorneys, NIJC provides counsel and representation to approximately 10,000 low income immigrants, refugees, and asylum seekers each year. NIJC’s legal services inform its advocacy, litigation and educational initiatives to promote human rights locally, regionally, nationally and internationally. An expert in immigration law, Mary Meg has testified before Congress and is often quoted in major news outlets such as MSNBC, The New York Times, and the Chicago Tribune. As an active member of the American Bar Association, Mary Meg chairs its Commission on Immigration. She is also a member of The Chicago Network, the American Immigration Lawyers Association, and the Chicago Bar Association, among others. Prior to joining NIJC, Mary Meg practiced civil litigation and was an NIJC pro bono attorney. Earlier in her career she worked in local communities in Chile to help safeguard the rights of individuals under a dictatorship. Swapna Reddy is co-founder and Co-Director of the Asylum Seeker Advocacy Project (ASAP), a nonprofit that brings rapid, remote legal aid and community support to asylum-seeking families in moments of crisis, including mass detention and raids. Since its founding, ASAP has prevented the imminent deportation of more than 400 asylum seekers in 30 states; provided community education to thousands of asylum-seeking mothers online; and mobilized more than 500 volunteers to carry out this work. Swapna’s work has been featured in numerous publications, including the New York Times, TIME Magazine, and Chicago Tribune. Swapna has a B.A. in Computer Science and Mathematics from Harvard University and a J.D. from Yale Law School. She has received numerous awards for her commitment to public interest work, and is currently an Echoing Green Fellow, an Equal Justice Works Emerson Fellow, and a recipient of the 2017 J.M.K. Innovation Prize. Prior to ASAP, she provided civil rights and immigration legal services and conducted artificial intelligence and development economics research. Dana Rusch received her Ph.D. in Clinical Psychology from the University of Illinois at Chicago (UIC). She is a licensed child clinical psychologist and Assistant Professor of Clinical Psychiatry at UIC in the Department of Psychiatry at the Institute for Juvenile Research. She is also a member of the Community-Based Dissemination and Implementation Science program for UIC’s Center for Clinical and Translational Science. Dr. Rusch’s research focuses on building university-community-policy partnerships to address the mental health needs of immigrant and refugee children and families. Using an ecological public health framework, she aims to develop models of mental health promotion that elevate the contributions of community-based organizations and non-traditional providers. This work also extends to translating research findings into policy level changes that can facilitate more effective ways to address mental health inequity. Dr. Rusch participates in local advocacy efforts to support immigrant and refugee communities, and she serves on several committees focused on the intersection of immigration policy and mental health. Reshma Shah is Director of Developmental and Behavioral Pediatrics in the Department of Pediatrics at University of Illinois at Chicago. Her research aims to reduce poverty-related developmental and educational inequities by developing, testing and disseminating primary care-based strategies that improve early childhood development. She is the principal investigator of a career development award from the National Institutes of Health and has also received funding from Maternal Child Health Bureau, The Society of Developmental and Behavioral Pediatrics and UIC Center for Clinical and Translational Science to support her work. As a developmental-behavioral pediatrician, Dr. Shah cares for young children with developmental disabilities, speech and language delays, and learning challenges. Claudia Valenzuela is the Detention Project Director at the National Immigrant Justice Center (NIJC). Claudia joined NIJC in 2002 as an Equal Justice Works (EJW) fellow. Claudia presently oversees NIJC’s Adult Detention project, which provides legal education and services to individuals in Department of Homeland Security (DHS) custody, as well as NIJC’s Defenders Initiative, which provides technical support to criminal defense attorneys representing foreign-born defendants. Claudia’s work at NIJC has centered on issues impacting individuals in DHS custody facing deportation, including due process challenges to removal orders, as well as unlawful detention and conditions of detention. Claudia is also a contributor to NIJC’s Immigration Detention Transparency and Human Rights Project, which aims to expose the lack of transparency and accountability in the immigration detention system. Claudia is a graduate of DePaul University College of Law. Yadira Vieyra, M.S. is a Research Specialist in the field of Child Development. She works at the School of Social Service Administration at the University of Chicago evaluating the effectiveness of doula home visiting services being provided to adolescent mothers. Yadira is currently collaborating with the University of Chicago at Illinois and Immaculate Conception Parish in Brighton Park through “Fortaleciendo mi familia” – a series of sessions aimed at bringing low-intensity cognitive behavioral therapy and psychosocial support to Mexican immigrant families experiencing distress, anxiety, and depression due to exposure to community violence, financial challenges, and migration-related worries. Recently, Yadira was appointed as an auditor at the Synod of Bishops in Rome to treat the topic: Young People, the Faith, and Vocational Discernment and will be representing the immigrant community in the United States. Stevan Weine is Professor of Psychiatry at the UIC College of Medicine, where he also Director of the International Center on Responses to Catastrophes (ICORC) For the past 20 years he has conducted a program of research focused on trauma- and migration-impacted populations. His research mission is to develop, implement, and evaluate psychosocial interventions that are feasible, acceptable, and effective with respect to the complex real-life contexts where migrants and refugees live. This work has been supported by multiple grants from the NIMH, NICHD, DHS, and other state, federal, and private funders, all with collaboration from community partners. This work has resulted in more than 80 publications and two books. He was awarded a Career Scientist Awards: “Services Based Research with Refugee Families” from the National Institute of Mental Health and “Labor Migration and Multilevel HIV Prevention” from the National Institute of Child Health and Human Development. He was principal investigator of a National Institute of Mental Health funded research study called “A Prevention and Access Intervention for Survivor Families” that investigated the Coffee and Family Education and Support intervention with Bosnian and Kosovar families in Chicago. Teresa Córdova (Moderator) is the Director of the Great Cities Institute (GCI) at the University of Illinois at Chicago and Professor of Urban Planning and Policy in the College of Urban Planning and Public Affairs (CUPPA).